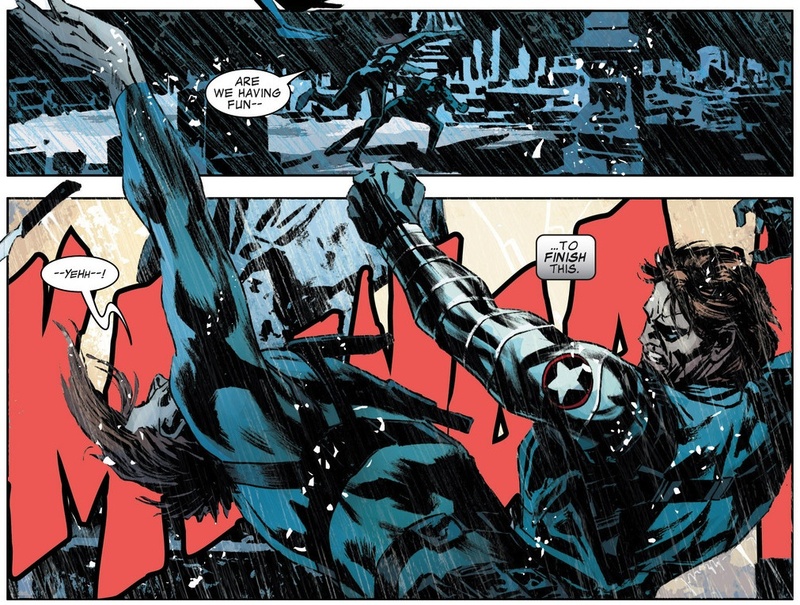 This is not so much a review of Winter Soldier 14, but a fond farewell to Ed Brubaker. Not only is he leaving this book, but also his Captain America/Bucky legacy, which has been great company for me over the years. When Brubaker took over this book, he decided to take it into a direction that was personal to him, and to a classic wartime perspective. Steve Rogers struggled with his future presence, dominated by his past achievements and haunted by his biggest failure, Bucky Barnes. The mardy and melancholic Cap found solace in finding out that Bucky had survived, unfortunately he was a Russian sleeper agent, and thus the epic Winter Soldier story was born. From this Ed took the book to extreme measures, he did the unthinkable; he killed Captain America. The world was stunned but the book continued successfully without Steve, but with Bucky at the helm; now that is how good a writer Brubaker is. Fast forward a few years and Captain America is now in the Zth dimension with Rick Remender, and Bucky has his own book: Winter Soldier. This issue ends the moody, wartime, sinful, redemption themes that encompassed Captain America since issue one, and with it the end of Brubaker. Bucky has been trying to bring back Natasha, who has been brainwashed by a fellow sleeper agent by the name of Leo Novokov. The story was been very well paced and told with great suspense, as Novokov appears to be a valid threat to Bucky. The brainwashing of Romanov has led to Bucky reminiscing over the love they shared, whilst she is trying to kill him. It’s a very interesting parallel to when Cap had flashbacks to his time in the war with Bucky, way back in the Winter Soldier storyline. 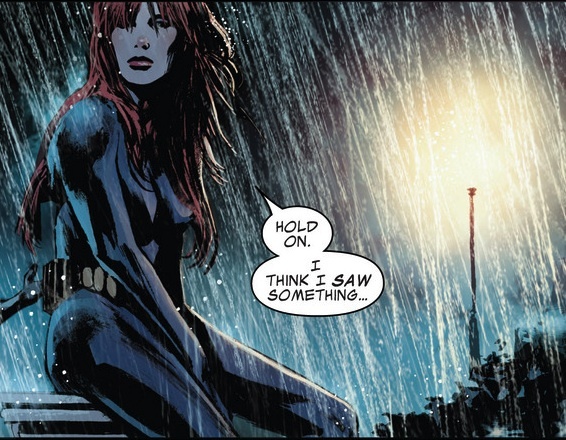 The theme of the book is perfectly suited to Brubaker’s stoic storytelling, and Black Widow provides meaning to Bucky’s despair. Butch Guice really shines on this book, and would have been a brilliant artist for Brubaker back when he first started. The mood is created by wonderfully drawn rain backlit by car headlights, moody snow blotted city landscape and silhouettes, and Nastasha in a cemetery, sitting on a tombstone, while the rain takes her hair down over her eyes. Just beautiful imagery and with the emotional background it just makes it such a poignant scene. The colouring palette is kept to dark shades of blue-black, and red, which highlights the scenes morbid nature. Even the sound effects are largely in red on a dark blue background. Huge credit is given to Jordie Bellaire and Bettie Breitweiser, the colourists, for really layering the atmosphere. The narrative is superb with well-paced writing and ample space for the pencils and colours to show the story. The plot ends leaving the reader satisfied but emotionally overwhelmed The book ends the arc and culminates Bucky searching for his lost love, wondering if they will ever be the same again, and deliberating whether he was ever any good for her in the first place. The emotional expressions on Bucky’s face are wrangled, as I imagine are his thoughts as well as ours. Ed Brubaker takes this book full circle as Bucky longs for Black Widows return, as Steve once longed for his. I wonder if we will see this type of book again soon, or even if we will see Ed make his return to the big publishers. Either way, I will always have Cap and Bucky in times of desperation and need, and I bid Ed Brubaker a tearful goodbye.